A man translates himself into a child asking for all there in a language he has barely mastered. Yes, I am asking someone, may be Time, to return my childhood days and translate the happiness of innocence back. Leonard Cohen reminded me of this– Canadian poet, singer and song writer. Cohen had once prayed for childhood and so he said prayer is translation. I am praying at this moment. But life seems to be unidirectional translation; one cannot translate the other way. I feel shocked when I feel my dreams translated into a harsh reality. I have quoted Cohen when I am struggling to establish a theory of translation. Today I am praying for my childhood too. I have quoted Cohen when I am aware of the fact that translation involves at least two languages; it operates on the knowledge of two languages at minimum. But it seems I had lost all pleasures and innocence before I contracted this disease long back, some half a century ago when my father admitted me to Sri Hari Middle School. Since then I started the journey to bilingualism that has led me to a great void today. It happened on a fine morning I still remember vividly. I just followed my father down the hill to the confluence where the blue Iwan (इवाँ ) and raging Miwan (मीवाँ) met. He held my hand while crossing the long suspension bridge over the swirling Miwan. It pushed along large boulders and they dashed against larger rocks. I walked on and on along the road. It was full of sharp pebbles, but I was curious to reach Gadi bazaar, on the way to my school, where I could see sweets, and people of my age wearing shoes, and toys and new clothes, sugar bags and many more. How happy are the shopkeepers! They are the owners of precious things in life. My father spoke, “To admit him to school. He is a bit mischievous at home.” I faintly remember he must have said so but my father’s heart was filled with love for us; he never imagined us being mischievous so I knew he had spoken to satisfy the silly villager. We went on and on; during the month of July; having finished all farming field work, perhaps I had nothing to do at home. An eight year old with a thin body, very rickety, whose mother’s womb was nurturing another unknown guest. We were already five siblings. The school was a strange place. A different world where my father talked to the Head Sir and may be Second Sir, both from Darjeeling, paid Rupee one or perhaps two towards registration, handed me over to them and returned home. It was almost midday, in a hot summer month. I did not know then that language was power. Today I know the maxim Language is power but they made me feel that my language is not power, theirs is. I am wielding power holding their language, I can pray and sing and boast in their language whereas mine is on the deathbed. I feel like I am always a parasite. I did not know then that any powerful language like English existed on this earth. I did not know that it was going to swallow my own. I was innocent and very happy without any. My mother tongue was enough. I did not know translation worlds. I was the first child to join any English school as both my brothers had joined Sanskrit. My father and his father and his father too had learnt Sanskrit. So nobody at our home knew about the rules of a school– how you behave when the bell rings, how you maintain time, what the teachers expect of you, which books you are supposed to study… Nobody knew about a pencil and a rubber, and the uniform that a modern school demanded. No wooden planks on which you spread soil powder and write with a small bamboo twig on it. It took many days for me to get used to the regulations of the school– by what time you reach there, how you stand during prayer, what is your body position, how your cleanliness is inspected, how you behave on the ground, in the classroom, during school hours and back home. What is homework, what the teachers expect from you and how your home environment never matches with that of the school. It was grade one. Half yearly exams were just over. Dashain and Tihar festivals were round the corner and we expected new dresses to arrive. The Gadi School was a completely new world for me. I felt a stranger, everything looked and smelled curious. I had two neighboring friends– Thule and Sane. There were Balram, Ganga and Tulsi (all boys) too but they came from a different world though all of us were first generation children to get admitted to an English school. In true sense it was not any English school but the very term ‘school’ itself had brought us the connotation of being quite foreign; they pronounced it an iskool and contrasted it with a Pathsala. A Pathsala is a very native, traditional, Brahmanic tradition of learning, a Gurukul where Sanskrit was taught both as content and medium, sometimes through translation and numerical, simple calculation, and some letters and application etc. in the vernacular. An iskool gave a different image of foreignness; something strange to the land and tradition. Every household used to have a Thulo Varnamala, the book of big letters of alphabet. We had one too. The Varnamala’s first lesson started with Devnagari letters of alphabet, vowels and consonants, then numerical and names of seven days and 12 months including general knowledge in the society. The Varnamala has a wide selection of materials from alphabets to slokas in Sanskrit, from Roman alphabets to simple sentences. I had learned Devnegari scripts perfectly before I joined the school. I had a scanty knowledge of Roman alphabet ei, bi, si, di … z, I could tell by heart. But I didn’t know how to write. The teachers would wonder how a little Brahmin boy could read even difficult conjunct letters and words. But his writing, in fact copying, was poor. It was for the first time that my father bought me a pencil, an eraser, a notebook and an old or a secondhand Arithmetic book perhaps. The Second Sir was great ‘master’ of English and song, a perfect music teacher always sitting by a harmonium. He used to write cursive A B C D and a b c d on blackboard. He drew those fine lines with the help of a long wooden scale on the middle of the board and he would write one by one artistically the junge a b c d, that is, a b c d ‘s with moustache, very perfectly. I tried to copy them; it was very difficult, even imitation of imitation was impossible. The notebook had limited paper and the pencil lead too brittle. I did not have a sharpener or maybe it was not invented till then. I would thrust a couple of books, a couple of notebooks, a broken pencil, a few scraps in the bag and run back home. Home was almost two miles up the hill and down across the raging Miwan and a dark forest of chestnut trees. Sometimes monkeys swinging from the branches in the sky would chase us. We were so hungry; I feel my hunger is still unabated. There was no Tiffin hour, no break, and no pocket money, nothing to eat. In season you could steal fruits from someone else’s garden though every tree used to be guarded by Oscar Wilde’s big giant. Or we could go to the forest beyond the river for some wild fruits like aiselu, jamun, kafal etc. The 20 minute break meant going to ‘the jungle’ by which we meant open toilet in the bush. Girls would wait for their turn until they were sure the last boy had returned. Or we could go to a spring to drink clean water. Father would often be far away, in some paradesh, meaning a foreign land, though not literally, mother would be around with little ones. After some khaja I would sit in the sikuwa with my books and pencil. Maldaju would sit close by me and ask, “What did the masters do to you today Saila? Did they beat you? Did they check your nails and dirty neck and knees again today? Who was punished today, how? Let’s have a look at your works– how your masters have written in your note book. Have they written in red? Ah, you don’t have a fountain pen and ink like theirs”. And I would open my paper. I remember now– the broken pencil needed sharpening, he would bring me a karda knife or chulesi, Mother would shout: don’t use the chulesi, Maila! It will go blunt and cutting vegetables will be a problem for me. Use your father’s karda. I would show him the dark paper, all rubbed sometimes with a rubber, very often with a nail scratched or rubbed using spit and made unusable and dirty. Maldai knew nothing about the iskool culture; mother knew nothing about the iskool culture and my father’s Pathsaalas long way back were completely different Gurukuls with a different culture. So I was very important, I pretended to know many things that Maldai and Mother never knew. Sitting close to me, he would ask, “Where do you sit in the iskool Saila? Does Thule also sit along with you? What do you sing in the prayer? What happens if you are late? Do the teachers beat if you do not satisfy them with a good answer? How do they teach you Nepali and Mathematics? Do you have an English book? Let’s see your books today.” He would smile, his lips would half open and dark eyes would ask me without any language. He was so eager, so curious about the intervention of a new culture in our family. The gesture was full of love and curiosity and I pretended to know: Angreziko junge akchher masterko jastai lekhnu parchha, natra marchan maldaju. (Oh my dear Maldaju, my second eldest brother, the mustached letters of English should be copied perfectly like those of the teachers or they will kill you). Copying junge a b c d took me many days but I could recognize them by reading the Thulo Varnamala where there were Nepali pronunciation of each alphabet such A P B aL C ;L.D 8L etc. They were not A for Apple days. We could never even dream of such things. Three months later came the annual exams. I don’t know what questions were given, the masters gave us carbon copies and some white sheets to write. I don’t know what I wrote but remember I was promoted to grade II. We were some 20 students including four or five girls, already marriageable as the society thought. Now I knew or learned from my company, knew the iskool rules perfectly, was aware of dirty hands and feet, teeth, nails and neck, was aware of homework, aware of the fight that took place among the hungriest of us on the way home or the swimming over the deep pond by the Miwa river sometimes barely saving oneself from sinking into it for ever. One of our little friends Gore lost his life in one rainy month. He didn’t know the river was flooded. I still remember how his hands fidgeted in the deep waters before he was finally swept away by the bluish currents down the big boulders. In grade II we still could not use fountain pens, and there were no ball pens invented I think. There were color pencils but we could not use them, only teachers. We did without any textbooks in grade I and II. But the teachers managed to teach us a few words– Sunday, Monday; January, February, One, Two, Three, Four etc. from their own books. Many of us became perfect writers of the junge a b c d but we had no books. Sometimes I would read the Thulo Varnamala and satisfy myself. I got a double promotion to grade IV. I was delighted and excited. My Maldai was happier than me though we didn’t know the meaning of it. I brought some chocolates and some other prizes home. In grade IV we got a set of textbooks; my mother bought them for me at a ‘second hand price’ from a neighbor who was selling her son’s books. She paid her some ghee, some bananas and may be 4 to 8 annas. Nothing has ever brought me such happiness. Father was away that winter, I remember. On Saturdays too I used to go to the garden, climb a tree and turn the pages of the books, especially English and Nepali. Maldai would sit by me and turn his pages; his was a different book of Sanskrit usually. But the Devnagari was quite inferior to English. Maldai was truly surprised and asked, “Saila, how do you read the English book? Will you read some lines for me?” His heart was full of such longings. I sometimes would boast “Since you know nothing it’s no use wasting time, the master would kill me.” But he would come closer and look at me with very innocent, dark eyes, seemed to smile from the corner of his lips and imploring eyes, silently, mysteriously, and lovingly. How dear he was. And still he is so for me. Hyallow Marsing, How do you ? Hyallow Gopal, How do you do? The teacher had taught us that way so without knowing anything, we just imitated and pronounced Hyallo Marsing How do you do? It sounded English but a sheer meaningless thing it was. Today I remember the teacher had taught us Mr. Sing as Marsing because Mr. could not be pronounced otherwise, as it is lacking a vowel. He had rightly invented the Marsing pronunciation. He would give stress on the word Hyallow though it was simply Hello. We learnt the meaningless rhyme by heart Hyallow Marsing, How do you? I didn’t know the meaning of how do you do until I did my bachelors degree in Kirtipur some 35 years ago. Maldai and I were childhood friends and shared the same bed for many years. We would study together in the warm glow of firewood and sometimes in a kerosene lamp nearby. But it was more expensive than medicine. Mother would just watch us in case we got sleepy so early. Sometimes I got angry and thought, why is this illiterate woman forcing me to read since she knows nothing? I know English… When it was late and piles of firewood exhausted and all our body was full of ashes, we would jump to our bed. Mother knew it was enough. We used to keep our books or bags close to our pillow or used it as one. One night I had a very bad dream. I woke up frightened. Some giant or ghost was chasing me and I was trying to catch hold of my mother. Terrified, I told the dream to her and said– we don’t like to sleep in that corner. It’s a horrible place so would like to change. Mother consoled me– I will cure everything, I know the medicine, don’t worry my sons. Then she brought some ashes in a scoop from the glowing hearth and sprayed it around our bed: Now keep the Gita book under the pillow, and no bad dream will chase you she said. In the meanwhile Maldai spoke: I keep the Gita and Chandee books under my pillow, and a small Khukuri too, but Saila puts his bag. “Oh I see, I got the point saila, do you keep that English book there too? Gods will be angry and they will chase you in dreams,” said my mother. This reminder was a serious warning. I faintly thought: I am not following the proper moral path of my parents; not doing a good thing, that angrezi has led me astray a bit. One day another neighbor of ours asked my father: guru, hamra saila nanilai iskulmai padhaune? bigrane hun ki ? Oh Punditji will you continue educating our saila at this English school? Won’t this spoil him? I don’t know what reply my father gave, but he felt quite uneasy to know they did not approve of the English education. Two of my elder brothers were safe– in Sanskrit education system. They were even appreciated as the followers of great tradition. I removed the bag with the English book from my pillow and I guess the Gita and Chandi books replaced it. They gave me sound sleep, happiness and deep solace. I gradually began to feel there were two worlds– home and school, the home never matched with school. How would they match? You have different books, manners, timing and a culture very slowly encroaching your world. In those days there was not a single English book in our home. Nobody could pronounce a word. I was undertaking a great venture by entering into an unknown world. After 50 years I can see I have destroyed my ancient home. I have allowed termites to eat it. So almost all of my books are English, hardly some Nepali and few Sanskrit. On his death bed my father expressed deep worries: Who will now use this property of mine, my Sankrit books, I collected throughout my life, this worries me a lot my sons. But we had chosen the way to ruin. How everything has been subverted and how a great tradition is being erased, like fertile land being turned into a desert. Why I read or was taught English, I don’t know. There was no explanation, no interpretation, no scope was clear. But my parents must have visualized that the iskool will educate our Saila and he will learn new things. Why did my father, himself a great Pundit, have so deep a desire for changing my direction? I am just wondering today. One day mother asked me to read the English book for her. There were other relatives sitting around. I read (It was in Grade V) the story of a Thirsty Crow and a Pitcher. I read it haltingly, after some time she spoke: janne bhaichhas Saila tara kyai bujhiyena. Oh Saila, you are quite a learned boy now but I could not understand anything. How we were forcing a wedge into our own culture. One day one of my phupas came to our place with his son Omnath, junior to me at the iskool. After meal in the evening, phupa asked his son to sit close by me in front of a flickering kerosene lamp and said, Oh my son why don’t you learn from Govinda saila the way he reads English. Then all family members gathered together and I began to read the English book. I began doing a meaningless thing, but they were proud to hear that Pundit’s son saila can read English. I began my performance. I could pronounce only half of the words correctly but nobody could tell even if I knew none at all. I could pretend now. Phupaju would look at my face. Sometimes blinking his eyes and sometimes nodding his head and changing his lips in shapes like mine and sometimes looking at each others’ faces with a sense of see what a great master has our saila become! He will be a glory in our family. He was very happy and surprised to see me doing a great magic. And he scolded his son “Why don’t you learn to pronounce clearly like your brother. Then Om Nath also obediently bent his head and tried to do haltingly, letter by letter, word by word, after me slowly the krau was thrusty, After long hours of trial my Phupa was so happy and so was Om Nath. My mother said: It’s good and enough, go to bed. But I knew Phupa was hardly literate in his mother tongue, Nepali. What a strange thing was happening! I was entering into a different world, deviating from all the centuries old values. One morning, Have you had any other bad dreams? Mother asked. No, since then they are ever good ones, mother, I said. English sounded an alien or a foreign thing. We thought we were becoming modern by learning more English. My mother was doubtful of its use; I half heartedly was lured and attracted to learn more of it. Every bit of things looked strange. My teacher Ganga sir was interested to teach me all the English he knew. I still remember one answer he wrote for us from a story: The disease to whom bitten by a mad dog is called hydrophobia. People will judge this kind of English but we were fed with love and affection. The words, their meanings and their sentences made up of them. The method we were taught was D O G -8Uf – s’s’/, we would repeat hundred times and learn by heart. But I didn’t know that the D O G in English, C O W in English, C A T in English were the same animals in my home. Why on earth were these new names given? In grade V, we had a textbook called My English Book, maybe prepared by a Nepali writer of Kathmandu. There was a rhyming poem. and the sun is set. We would sing it in chorus. But there was a friend, already a boy of 18, though one of our class friends. He was Kadariya. On his left temple there was a large spot of burn. We would call him …88]Ú (burnt one) when angry. He would chase us and beat us mercilessly when he heard the song. because ‘The Day’ was pronounced like …88]Ú a single word in Nepali. We didn’t know there was a grammar, we never knew a book like Dictionary would exist. We knew English books, the teachers teaching us. 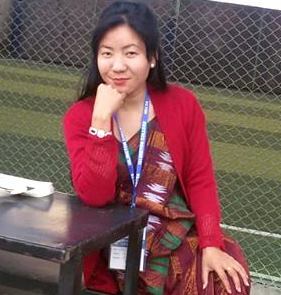 When both the Darjeeling teachers left our school, some local teachers were appointed. They were very much learned. We regarded them as scholars. Obviously they both had passed School Leaving Certificate Exams, that is, grade X equivalent national exams. I grew more eager to learn English– by reading books many times, by learning word meanings by heart, by writing as beautifully as possible. There was no spoken class, no use of speaking. We were ashamed of speaking a foreign language. My mother wanted us to follow the path of my father and kakas and grandpa. No woman was an ideal, worth following. They had wishes and dreams but those were quite inferior. All were illiterate, lacking in knowledge and wisdom. When I read Pahadjasto Batojasto Ma of Manjul Dai, a famed Nepali poet, I feel pity for my mother, for all the mothers of those days. They were deprived of all opportunities and were simply imitators of their mothers, followers of their husbands, and the traditional social norms and values. My father used to take us both, me and maldai, to some jagges, when Brahmins would perform some religious rituals like pooja, homadi, reciting of some religious texts, or small apprenticeship to a major pundit. We would sit close by father and imitate taking a bath, putting chandan and observing fast in a dhoti– there are many things a Brahmin boy follows and observes. At the end of the day we would earn some four or eight anas, some gifts, presents, offerings and lot of honor. To be worshipped as a bahunnani or guruputra or the son of a Brahmin was a great honor, incomparable. I did help my father, follow him and Maldai; my mother was happy; English had not much spoiled my mind, or culture. One day my mother went to an astrologer and asked him: Daju, what will our Saila be in future ? The astrologer read my horoscope for long and said, Bainee, Saila will be a Pundit or a Dhami, that is, witch doctor. No third choice. Satisfied, my mother brought me back home. Then I began to imagine being a Dhami and beating a dhyangro, I did it secretly thinking of how my kaka used to do the same. The Pundits and Dhamis were much honored in those days. I was very good at English. Having passed grade VII, I descended to the plains, after some six days’ journey from the hills of Panchthar, eastern Nepal. There was no high school education facility. So Father brought me there. In the plain lands I saw a concrete building for the first time. I touched a transistor radio for the first time with my own hand. I could see a bicycle, I could ride a bullock cart for the first time. I could see markets and bazaars, even a town with land rovers and trucks. I landed in a different strange world. I began to live in a hostel with other boys. At the age of 13, I was admitted in grade VIII. As one of the brilliant boys, there I had no rival in English. The teachers loved me so much. They taught us in new style; there were even two volunteers: Tim and Peter. I started talking with them too. I was so proud, happy and distinguished– I thought. We were some 20 boys in the hostel. We cooked our own food. I was considered too rustic and uncivilized as I hailed from the ignored hills. I had not seen the world, not known manners. I was not modern. One day they proposed that one should eat eggs to gain stamina, Health Books also said eggs have high quantity of vitamins. You will be weak and cannot study away from home suggested one of uncles there. I had no courage to touch one. But they used to boil and deep fry the local eggs in oil and spices until they turned brownish red. Each had a share of two. Whether one ate or not one had to pay his share. So I was also attracted and lured and tempted to the road of hell. For a whole year my heart was filled with remorse and guilt. But I could not undo it, because my temptation had spoiled me. How could I tell my parents I ate eggs? Not only this, there were other similar roads. I walked them too. One day I got my hair cut by a barber instead of getting it shaved. A Brahmin boy began to spoil himself further. I came home from the Hostel after six months completely a different boy. Having seen my head father asked me to shave instead. I did it. Every evening he would lead us to sing a prayer from the Bhagwad Gita, Brahmanand Bhajan Mala or some other great works. We would follow him– mothers, brothers, sisters, uncle or guests if any, for some 30 minutes or so. Father had taught Mother how to read, but her voice was so sweet and she would love to sing with father– a sharp melodious tone would pervade. Father contemplated a spiritual world, meditated in great Sanskrit but I felt quite irritated, though I could not express it. I thought he was in a worthless world compared to mine. One day father asked me to follow him to a pooja where I could recite any book as part of ritual where he would do the major part. I said yes in the morning and father left but when it was time for me to go I just pretended I had a stomach pain. I went to bed instead, spent the whole day writhing in it. My mother was worried that some spirit had caught me. Since then I never followed my father, I never obeyed his requests to do the religious things he did. He knew perhaps I had no respect for the tradition and never insisted. I then took the ways of Willy Chandran– a character of VS Naupal’s in his Half a Life. I was capable of ignoring my own parents and their ways of life. I thought ‘English’ had taught me new truths. I thought it was far better than my father’s. I learnt more and more English without any purpose in mind. Hundreds of centuries had made my father’s heart. He was saturated with Oriental knowledge, spiritualism, humbleness and God’s ways. But gradually I moved to another direction– I bore a heart void of past and sans spirituality, it was a sheer materialistic education, so called scientific, that forced everything into disconnected fragmentation. My parents had the ancient Gods with them, how strong was their belief and faith. Had they known I would turn such a hopeless materialist, they would never have bought me a pair of expensive Western spectacles. They now began to believe they had exchanged gems and rubies for a fake trinket. Today I wear the fake gem and dance happily. I feel, half century of my English has successfully tuned me into a rootless man. A man without his past because English does not bring or preserve my past memories. It promises me a wonderland where I find no root, no origin of mine. My parents are disconnected now. English had brought us new values, new cultures, new facts and truths. It has replaced mine and buried them deep into oblivion. A race without past is like a kite cut off and disconnected. English brought us many things– their literature, their history, geography values and glory. It buried ours gradually. Now it seems intolerable. But we cannot go back. Let me just quote Frederic von Schlegel, the great German writer critic and philosopher, the most prominent founder of German Romanticism—The ancient Indians possessed a knowledge of the true God, conceived and expressed in noble, clear and grand language… Even the loftiest philosophy of the Europeans, the idealization of reason, as set forth by the Greeks, appears in comparison with the abundant light and vigor of oriental idealism, like a feeble spark in the full flood of the noonday sun. I have enough time to repent that I am dancing around the feeble sparks today. But I have no time to unlearn this artificial knowledge and regain my lost paradise. This knowledge I got through English however. Govinda Raj Bhattarai is a highly multifarious academician. A Professor of English, Dr. Bhattarai is editor, translator, novelist, essayist, columnist, linguist and one of the most popular critics in Nepali literature. To his credit, he has got more than a dozen of books and hundreds of articles published in newspapers, journals etc. He has widely traveled and presented papers on different linguistic, ELT and literary issues such as post modernism, diaspora etc. He has led NELTA and Linguistic Society of Nepal twice in the capacity of President. His efforts to promote Nepali literature has ascended him to a great height. A well-known postmodernist, Professor Bhattarai ever writes from his heart and aspires to change the troubled Nepalese literary/academic landscape. Reading the article by our respected guru made me feel as if I was watching the visual recording of his school life and beyond that. The writing is so vivid that we can feel that all our sense organs are involved(seeing, touching, tasting,smelling, and listening). He has presented the reality and given the sense that English has been the killer language-commiting the crime of liguicism. However, the bitter reality is that we ourselves are promoting this. We sing VAJAN of the English language. We are happy of being rootless. Still there is a big question: Can we follow nationalism in true sense? This has been like NAKHAU BHANE DIN VARIKO SIKAR KHAM BHANE KANCHA BABU KO ANUHAR. Well, the article that I made several attempts to read thoroughly and of course I did do it has its own taste of the conflict between the spiritualism and materialism. The then spiritually-endowed Nepali society had its own charm and life was artistically shaped by the faith in the traditional values and aptitudes to face the hardships posed by nature – the lacks of roads, vehicles, transistors, etc. It sounds natural that the narrator, highly respectable Govinda Sir, made a shift to the world of novelty and facilities in his childhood by joining school rather than Pathashala, getting ecouraged and given more value by relatives and adjusting himself in the surroundings and cultures of better comforts in the plains for further education. And, these days, in spite of having made great achievements in the eyes of materialists, feeling spiritual void and turning to the spiritual touch once his father had, perhaps at the similar age, again sounds natural. But, it is a great lesson for us to think over how to maintain balance as a spiritual materialist. I hope anyone who reads the reminiscence will feel guided to the question ‘Would you like to search yourself once and try to answer what way you are going to?’ I felt myself deep in the ocean of the great thoughts with no thoughts but the wonder of solace. Thank you very much Bhattarai sir for such unique and original feelings of your childhood. While reading the article I sank into unfathomable depth of the truth during your childhood. While going through this article for three hours, I forgot to have my meal; It seemed as if I was watching the vivid picture of my childhood. Going to school with some anas for breakfast and plucking mangoes, plums, banana and so on on the way, all these tidbits of childhood really must have touched everyone’s heart who has read it. In this composition, Professor Bhattarai Sir has talked of the compulsion of doing unwanted works in hostel. The English language has been killing languages of our country but it’s our compulsion and the demand of the day to learn it. According to jotshi, Dr. Bhattarai wanted to be a pandit but his fate made him a very special figure and a fate maker of so many Nepalese. A superb biographical essay truly it is. This is in response to your article Reminiscing My Childhood Days. The article is not only an autobiography reflecting the childhood and schooling but also a brief analysis of the past and the present educational system. This article is a must read to all the scholars, especially to those who despite all the facilities, resources and parental support do not concentrate in their studies and are not much dedicated to learning. Here we read at the same time the struggle-story and the success-story of a noble man who right from his childhood dedicated himself to learning and studying fighting all the odds. Crossing rivers and climbing hills to reach the school is perhaps unimaginable to today’s children. But the hunger for education, thirst for knowledge and the burning desire to be someone filled the young soul with so much inspiration and enthusiasm that he chose to walk the untrodden path. Like the genius “Arjun” of Mahabharata the bright scholar was loved by all his teachers. And those were actually the baby steps the young boy of yesterday took along the long road of struggle in shaping his future where he stands tall today as a highly respected academician, professor, editor, translator, novelist, essayist, columnist, linguist and one of the most popular critics in literature. After reading the article I sat down to think for a moment if I could name any other personalities who have mastered both the English and the Nepali language and literature so well besides Dr. Bhattarai, but even after deep contemplation nobody came to my mind. There are trekkers and track-makers in each and every field of life. It is very easy to walk an already-built road following other’s footsteps. However, to become the one to make a new track for many trekkers and lead them towards the destination is a real challenging task. Our country needs many of such track-makers like Professor Govinda who can do monuments.